Mayor Ras J. Baraka, New Jersey Institute of Technology (NJII) President and CEO Donald Sebastian, Newark Downtown District CEO Anthony McMillan, and other dignitaries launched a citywide initiative today called “Brand Newark,” to propel the city into becoming one of the most technologically-connected cities in the nation, at a kickoff at New Jersey Institute of Technology. NJII is an NJIT corporation. Newark is taking the necessary steps toward becoming a “Smart City,” as part of a sweeping White House initiative that brings together academia, government and business to innovate and create the next generation of urban technology and infrastructure. For communities like Newark, these solutions would permeate all parts of the city experience for residents, daytime workers and visitors. “This is a big step forward for the City, to make us an innovative hub where tech companies will want to locate. Brand Newark is a physical extension of that, and a way that the neighborhoods can feel like this innovation is all around them and they are a part of it. We want to make it happen right here, a smart city, gigabit internet, and a tech-savvy workforce,” said Mayor Baraka. “Imagine Newark as a city where technology enhances every part of your life, wherever you may be,” said Mr. Sebastian. “Through the Smart Cities initiative, we will be reshaping and enhancing how the public experiences Newark. The open technology infrastructure we are creating will be a magnet to attract entrepreneurial businesses whose products will reshape urban life using the Internet of Things, and they will contribute greatly to the economic vitality of our city. With smart city technologies, Newark can better tackle key challenges such as reducing traffic congestion, fighting crime, fostering economic growth, managing the effects of a changing climate, and improving the delivery of city services. It is part of the national “MetroLab” network, in which NJIT and Newark joined 40 other regional city-university partnerships across the nation. The local program is called MetroLab@Newark. Funded by the Newark Downtown District, and supported by the city, an Internet kiosk (named Brand Newark) will open on the site. It will be a powerful Wi-Fi hub that will provide residents and visitors with the latest news and information on local businesses, traffic, mass transit schedules, local news, videos and other important features via a next generation fiber optic network. The information will be fueled through “Brand Newark,” which will provide the free Internet, without the need for users to register. 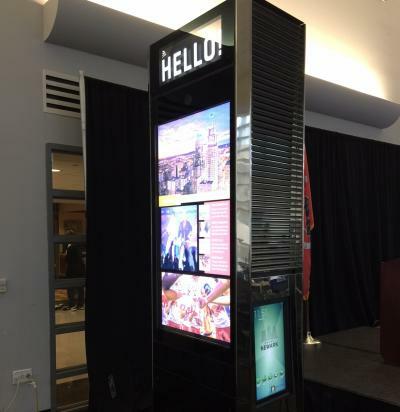 Innovators and developers will be sought to continually expand the capabilities of Brand Newark, as kiosks will ultimately be featured in all five wards of the city. Learn more about opportunities at BrandNewark.org.